Rhaetian Railroad class Ge 4/4 II electric locomotive, road number 630, in the advertising design for Chur-Disentis. 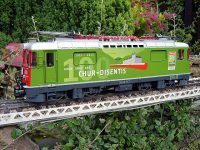 This model is being produced in a one-time series only in the anniversary year of the Rhaetian Railroad. It has many sound functions such as the sound of the traction motors, train announcements, station announcements, compressor, whistle, main blower, squealing brakes and much more. It also has triple headlights that change over with the direction of travel. The locomotive has pantographs that raise and lower electrically with the direction of travel. In addition, it also has cab lighting, general-purpose sockets, traction tires, cab doors that can be opened and closed, and 2 powerful Bühler motors powering all of the axles. Length over the buffers approximately 57 cm / 22-7/16”. 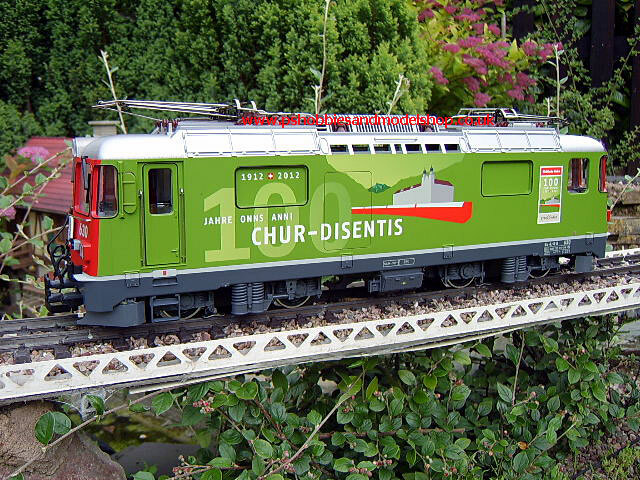 Rhaetian Railroad class Ge 4/4 II electric locomotive, road number 630, in the advertising design for Chur-Disentis. This model is being produced in a one-time series only in the anniversary year of the Rhaetian Railroad. The locomotive features extensive equipment. It has many sound functions such as the sound of the traction motors, train announcements, station announcements, compressor, whistle, main blower, squealing brakes and much more.